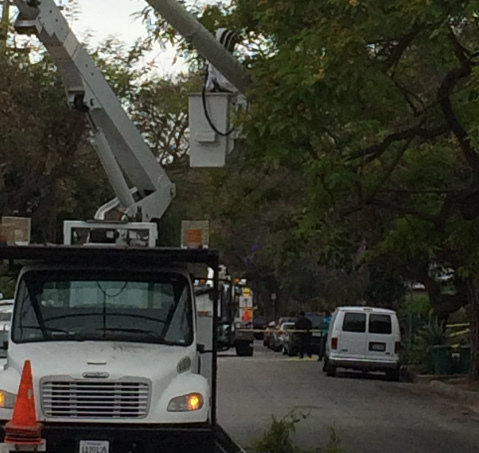 A city bee removal expert takes down a swarm in a tree on San Pascual Street. A couple swarms of bees closed about four blocks at San Pascual and Valerio streets on Santa Barbara’s Westside for several hours yesterday afternoon when a tree-trimming crew unexpectedly bumped into a hive. The irritated bees stung two workers, who were clearing tree branches away from electrical wires, sending one to Cottage Hospital with more than 30 stings. A City Fire engine crew was dispatched to assist in the medical emergency, and City Parks’ bee removal specialist arrived and noted that the bees were too agitated to be approached. The photo at left shows the swarm and the waxy hive they’d built, probably as a temporary home since bees prefer to be in more protected areas like the bole of a tree, said Tim Downey, the city’s urban forester. The swarm calmed down when it got dark, and the beekeeper was able to remove the hive. 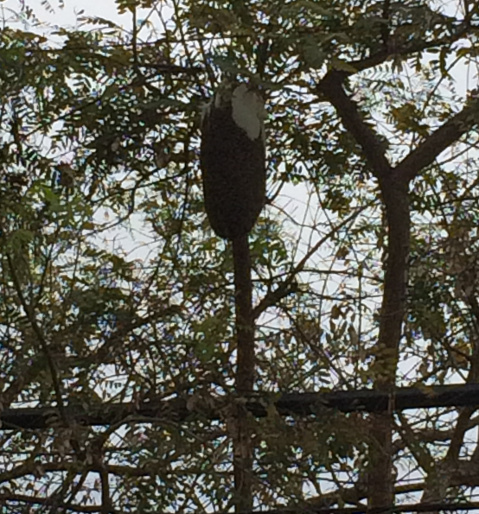 Earlier in the afternoon, he had taken down a second hive located in a tree across the street. Both sets of bees will be released in a less populated area.